Page revised in November 2009. Giuseppe Vasi was always very accurate in depicting the architectural details of the monuments, but occasionally he did not pay enough attention to the consistency of the shadows projected by the buildings. In this plate the façade of S. Clemente is in the shadow and based on the angle made by sunlight on the porch one would assume the view was taken in the afternoon. The house on the left side of the etching and the Colosseum at the end of the street are well illuminated and this occurs in the morning. The view is taken from the green dot in the small 1748 map below. 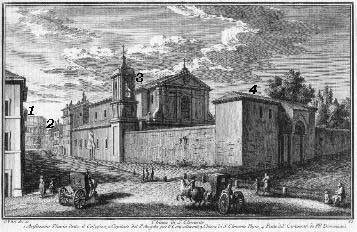 In the description below the plate Vasi made reference to: 1) Anfiteatro Flavio (il Colosseo); 2) Ospedale del Padre Angelo; 3) Chiesa di S. Clemente; 4) Monastero dei Padri Domenicani. 1) is covered in another page. 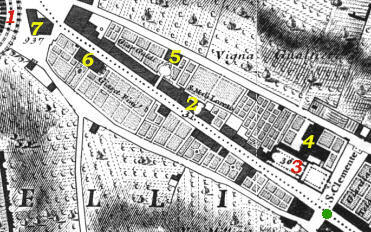 The small map shows also: 5) Casino Evangelisti or Guidi; 6) Casino Fini; 7) S. Giacomo del Colosseo. The dotted line in the small map delineates the border between Rione Monti (upper part) and Rione Campitelli (lower part). The street leading to the Colosseum was opened by Pope Sixtus V to facilitate the access to Piazza di S. Giovanni in Laterano; at Vasi's time it was an important street, but today cars and buses use a modern parallel street, so this corner of Rome is pretty much as it was in the XVIIIth century. The long pontificate (1703-21) of Pope Clement XI was characterized by major financial difficulties, which in part stemmed from a series of natural disasters (a major flood in 1702, an earthquake in 1703, a drought in 1706) and in part were caused by the Spanish Succession War during which the Papal State was crossed by French and Austrian armies directed towards the Kingdom of Naples. 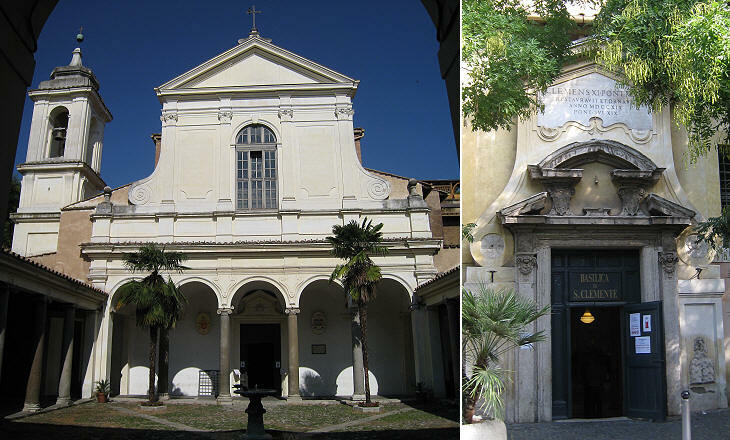 The pope would have liked to associate his name with a major embellishment of Rome, but he had to content himself with the restoration of some ancient churches such as S. Clemente, S. Eusebio, S. Maria in Cosmedin and to a lesser degree S. Maria in Trastevere, leaving to his successors the honour and the burden to take care of the great basilicas of S. Giovanni in Laterano, S. Croce in Gerusalemme and S. Maria Maggiore. Carlo Stefano Fontana was the architect in charge of the renovation of S. Clemente which mainly involved the façade, the ceiling and the side entrance. 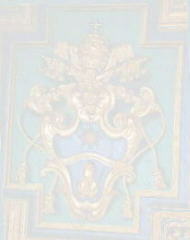 The architect made large use of the papal coat of arms and heraldic symbols in the decoration of the new parts of the church (the image used as background for this page shows a detail of the ceiling). You may wish to see the church as it appeared in a 1588 Guide to Rome. The most ancient records related to S. Clemente set the foundation of the church in the late IVth century and until the XIXth century it was thought that the ancient building had been largely modified in the XIIth century, but there was no suspicion that it still existed beneath the floor of the current church. In 1667 S. Clemente and the adjoining monastery were assigned to Irish Dominican Friars. In 1857 Fr Joseph Mullooly, superior of the convent, started excavations which led to the discovery of the IVth century basilica. The Irish Dominican Friars are still in charge of S. Clemente and they have developed an advanced website (external link). The beautiful schola cantorum (screen of the choir) belonged to the lower basilica and it was relocated to the new one in the XIIth century; you can see in more detail this work of art in the historical section whereas details of the apse mosaic are shown in a page on the golden mosaics of Rome and of the ceiling in a page on the iconography of the saints. The excavations led to the discovery of an ancient Roman building which housed a mithraeum; it is the only one in Rome which can be visited on a regular basis. A mithraeum was designed so that it had the appearance of a small cavern (spelaeum), therefore it did not have windows and very often it was located underground. Usually the god was portrayed in a relief, rather than in a statue; this because the relief could include references to various aspect of Mithraism. It is thought that the sacrifice of the bull was a reference to the stars of the related zodiacal sign and to the axial precession of the Earth. It is interesting to note that Mithras never looks towards the bull, an additional indication that the sacrifice was a metaphoric one. The IIIrd century AD was the golden age of this religion, which had many points in common with Christian practices and beliefs: Mithras was born out of a virgin during the winter solstice; the followers went through various steps of initiation; ceremonies included forms of baptism and the consumption of bread and wine. 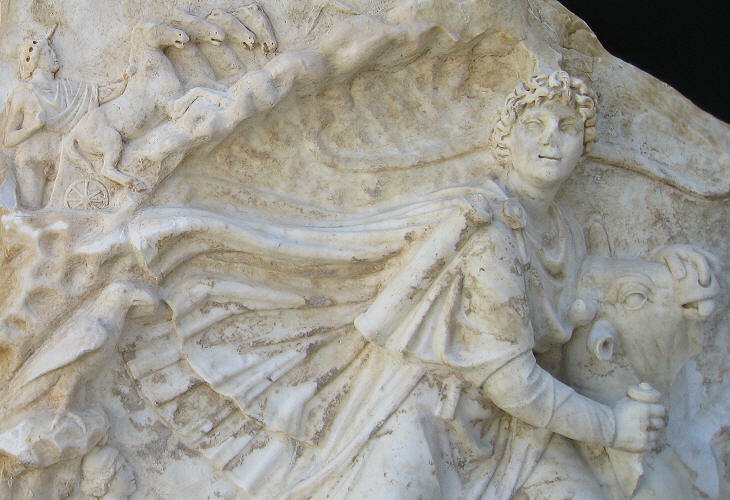 The cult of Mithras also had points in common with that of Sol Invictus, the worship of the Sun as the only god, which was very popular among the ranks of the Roman legions. Ravens had positive connotations: the raven was the link between Mithras and the Sun and the name given to the first step in the initiation ladder; ravens had positive associations also in the accounts about the lives of early saints: a raven daily gave a loaf of bread to St. Paul the Hermit and a raven prevented St. Benedict from eating poisoned food. 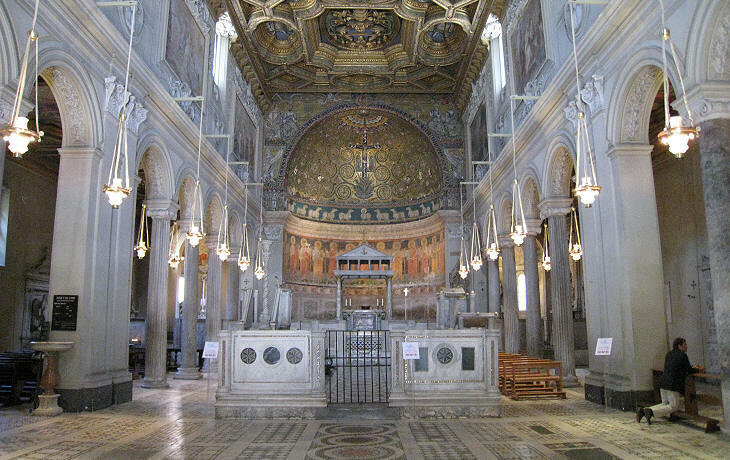 Padre Angelo (Paoli) was a Carmelite monk who used to visit the sick at Spedale di S. Giovanni in Laterano; towards the end of the XVIIth century he founded an institution to help those recovering from an illness. 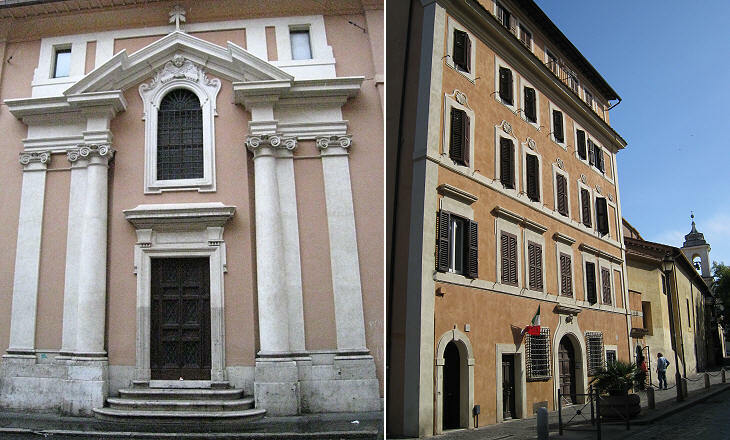 During the pontificate of Pope Clement XI a small church was designed by Giuseppe Sardi. The façade is the only remaining part of the church and of the buildings which housed the institution. The restoration of S. Clemente was accompanied by the construction of several new houses near the church; they have not been significantly modified since then (the image shows that behind the church; that on the other side of the street can be seen in another page). According to Italian Touring Guide this elegant building was designed by Giovanni Battista Mola (1585-1665) and it is named Casino Evangelisti; the number of windows however is typical of the XVIIIth century. According to other sources the building was called Casino Guidi (this name appears in the 1748 map at the top of the page); it was recently turned into a hotel: its owners claim that the origin of the casino goes back to the XVIth century and that it was a hunting lodge (!) 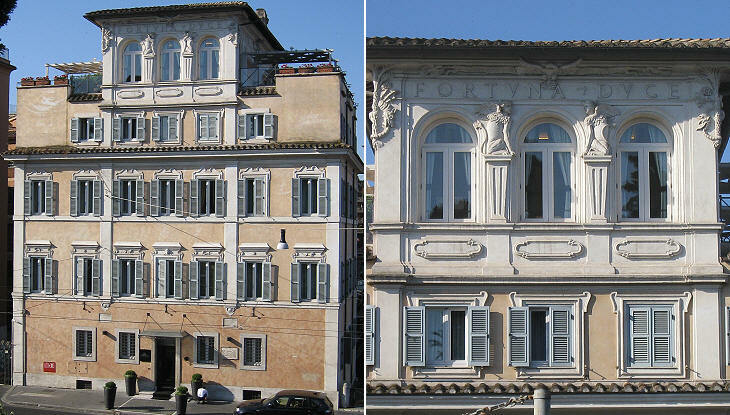 of the Guidi family; the motto on the loggia is a quotation from Cicero comite fortuna, duce virtute (to be led by virtue while being accompanied by chance) and it is most likely a modern addition. For more on Roman Loggias click here. 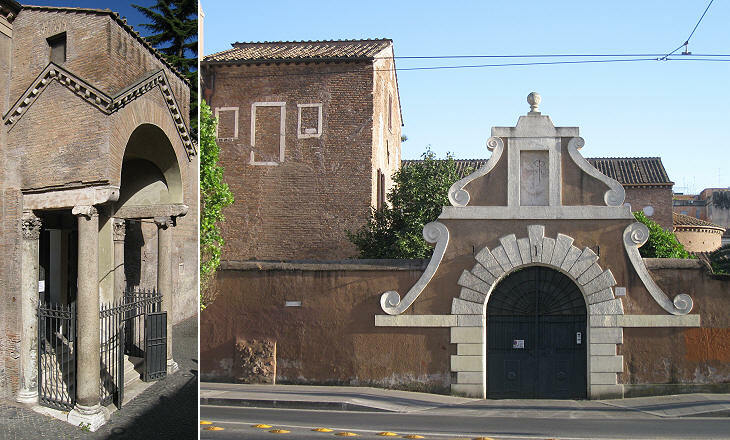 A small XVIIth century building (Casino Fini) has lost its original appearance because its closeness to Colosseo has led to opening too many shops and cafès and in addition only half of it was repainted. Between Casino Fini and Colosseo there was a church (S. Giacomo del Colosseo) with a hospital (a branch of Spedale di S. Giovanni). 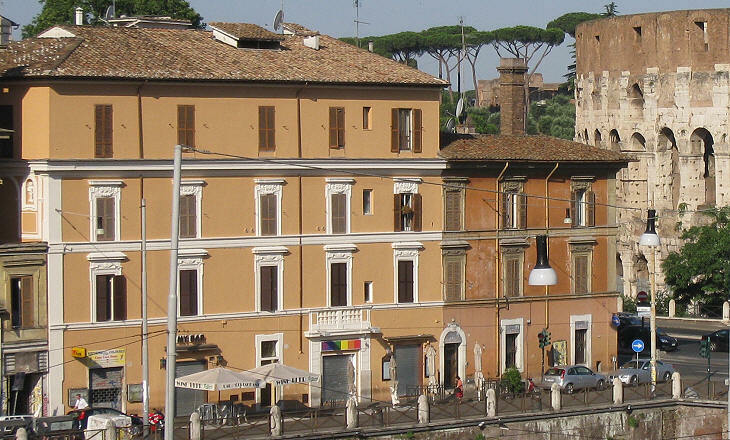 In 1815 it was pulled down to enlarge the open space around Colosseo.